Noto Town, Shika Town, etc. Noto beef is a brand-name product of Noto. 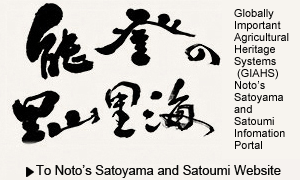 If beef satisfies the following criteria, it is approved as Noto beef and a certificate is issued: The pedigree has been identified and is Japanese black cattle; the last place where the cattle was raised is Ishikawa, and it was raised in Ishikawa for a longer time than it was raised in other places; it is rated as Grade A3 or B3 or higher. Noto beef is characterized by its high-quality fat containing a high ratio of oleic acid, which creates tenderness and aroma. High-quality Noto beef is sold as Premium Noto Beef. Noto beef is the result of crossing the Japanese hybrid cow (which was produced around 1934 by crossing Hyogo cattle for quality marbled meat and large Tottori cattle) and the Hyogo ox. In November 1995, 31 heads of cattle were shipped for the first time. In 2014, 695 heads were shipped from Ishikawa.